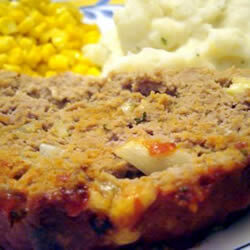 I made a double batch of my Cheesy Turkey Meatloaf last night for the family and didn't even have enough leftovers for a meatloaf sandwich for myself - that's how good this recipe is. It was absolutely devoured and had the men begging for leftovers. And I must admit, I do think this is my best recipe to-date. It is so easy to make, barely dirties any dishes, and is so warm and cheesy, it's no wonder it is considered comfort food. This was the perfect dinner to have after spending the night carving pumpkins and pairs very well with your favorite pumpkin flavored microbrew. The recipe calls for turkey meat, but my last attempt to make this was disasterous because I overdid it with the liquid ingredients and it disintegrated the turkey meat, so this time I used a more soluble mixture of ground beef, pork and veal. But the original recipe calls for ground turkey and I would recommend trying that first so you can have a healthier meal. Boil water for potatoes, and added peeled/sliced potatoes. Cook for 45 minutes. In a bowl, mix the turkey, breadcrumbs, eggs, onions, and liquid ingredients. Add seasonings. Fold the shredded cheese into the mixture. Transfer to a loaf pan, and top with Jack Daniels BBQ Sauce. Mash potatoes and add all ingredients until taste and consistency is to your liking.